Our members consist of a very special breed of person. In most military services, you can be all that you can be, but the members of this club who joined the Marines, found themselves being more than they ever thought possible. Both Marines and FMF Corpsmen who wore the eagle, globe, and anchor, have a very special bond and loyalty to one another, which comes quite natural to us. 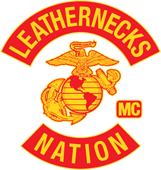 When you combine this bond with the love of motorcycling through the beauty of the country in which we would die for – you’ve created a special breed of person – A Leathernecks Nation Motorcycle Club Member! We are looking for a few good men who served with the Marine Corps, as well as Navy Corpsmen who served with the FMF. Honorably discharged, active duty, or retirees only. Our colors are earned only through hard work, respect, dedication and loyalty to the club. All cruiser style bikes are welcome but American is preferred. We are not a 1% club. We are in no way affiliated with LMCI.